Danny’s Justa Pasta first opened its doors on May 1, 1983. Danny has a strong affiliation with the Sundridge area as his parents owned The Village Steakhouse in Sundridge for 35 years. When a vacant restaurant facility in the area presented itself as an opportunity for Danny to open his business, he jumped at the chance, and the rest, as they say, is history. Danny's has enjoyed great success and press. In 2001, his restaurant was featured in the Autumn issue of Food and Drink Magazine. A Great Location Justa Got Better! Sundridge, Ontario is conveniently located at a mid-point between North Bay and Huntsville along the newly four-laned Highway 11. The recent overhaul of the highway is very exciting, as it will allow for a much safer and faster drive to the restaurant. Get-togethers with friends and family for great food and atmosphere will now be easier than ever. Leave the cooking and the clean-up to the great folks at Danny’s! A Big, Happy, Food-Lovin’ Family! The success of Danny’s can be attributed to the amazing staff that have been part of the restaurant family for many years. The privilege of helping a young person along their chosen career path, either in the restaurant industry or whatever it may be, has fostered a very caring and nurturing workplace for many people. Of course, Danny’s couldn’t possibly be where it is today without it’s loyal and appreciative patrons. Many of which are considered part of the Danny’s extended family. Like any family, Danny’s Justa Pasta has had the pleasure of watching it’s youngest fans grow into young adults and begin to have kids of their own. It’s also been fun for Danny’s to meet and watch brand new customers experience Danny’s for the first time and then become part of the group. Thank you to everyone for appreciating the hard work and care that Danny’s Justa Pasta has put into their establishment, and for making this food adventure a truly tasty one. “The Store Next Door” first opened in May 2000 as a cool idea to create a beautiful waiting area for Danny’s patrons during busy restaurant hours. 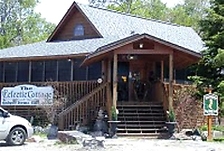 The store has since grown into a destination of it’s own for treasure hunters looking for a unique gift, or even better, something awesome for themselves. The merchandise is true to the store’s name; eclectic. From jewelry and handbags, to home, kitchen and garden décor, everyone who walks through the door eventually finds something they want to take home with them. 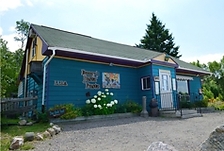 The Eclectic Cottage has unique finds from all over the world, including Canada, as well as local artisans from around the Almaguin Highlands area. Contact The Eclectic Cottage 705-384-1478.